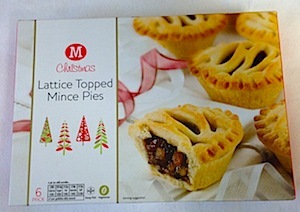 A pack of 6 mince pies with a lattice top from Morrisons Supermarket. These are the only vegan mince pies I could find in Morrison, the others from their brand are not OK. 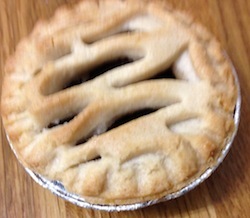 I quite enjoyed these mince pies, the mince is sweet and slightly spiced with a lovely flavour with a hint of orange. The pastry is also OK, it is a bit stodgy but because there is less due to the lattice I think they work fine. I like them best warmed up. Each pack of 6 mince pies are suitable for vegetarians and vegan as far as I can tell. Per pie is 248kcal. Sold in Morrisons supermarkets.